So this project was a design of Cynthia Rutledge. It was my first class with her and a pretty darn good one. There is more reading then I’m use to with patterns, but ample diagrams that it’s very easy to navigate yourself throughout the pattern without too much trouble. 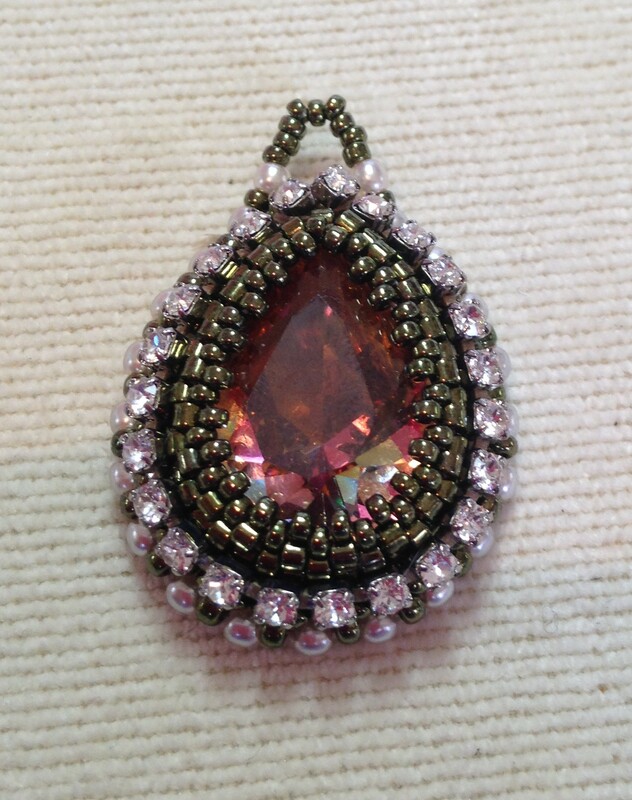 We started with the pendant. It was my first time incorporating a Swarovski crystal cup chain. We also made the initial circle for the pendant to nestle in pretty different from what I am use to. Here’s how: Instead of making your typical loop of beads and then adding another row to start peyote… You make a row of beads, come back and add in your third row of peyote, then connect the ends to that you now have a circle. Interesting… And if you would like to see this method with pictures let me know! I can make it happen! My favorite part of this necklace was working on the caterpillars… Yes, a very technical name 😉 These little guys to look like bugs after all the ends are added on. We got to make two of these creatures. 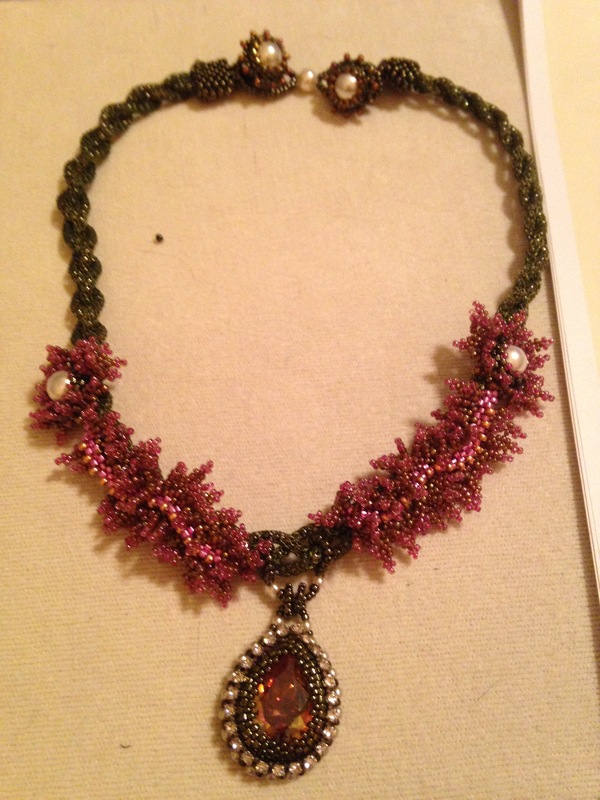 This necklace had several components that went into making it. I finally got all of them done and then I was ready to attach them together. This was the hardest part of the entire piece. It was super fiddly. I got extremely frustrate and text messaged my mom complaining. Even though she insisted I go to bed and put it away for the night I couldn’t!!! I stayed up listing to the Gilmore Girls and getting all these units together. YAWNNNN I slept extremely well that night. So shiny. 🙂 It’s a very romantic piece. 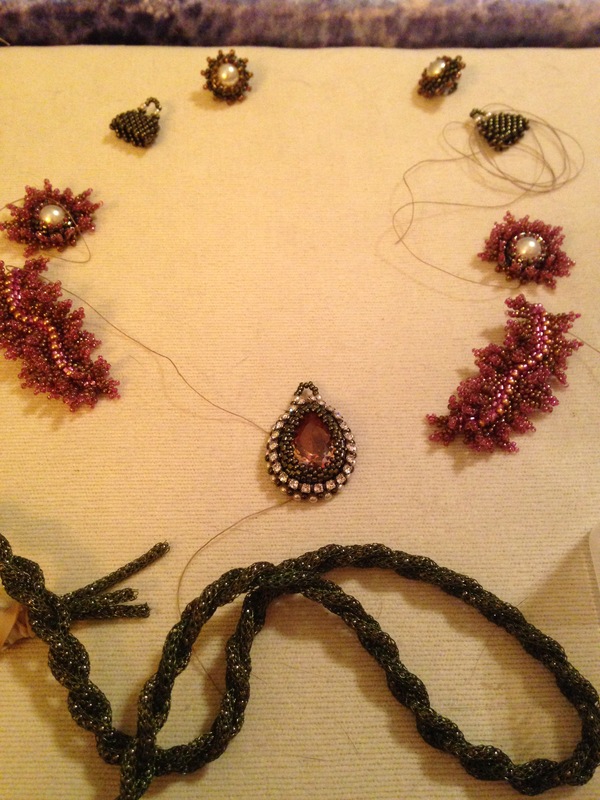 I’ll be taking another class with Cynthia this summer at Beading on the Vine again.